My mother and I tried Skinnygirl Margarita, the ready-made margarita by reality TV star Bethenny Frankel, originally one of The Real Housewives of New York City and more recently on Bethenny Ever After, both on Bravo TV. Margaritas are one of those drinks I love (I’m a on-the-rocks-with-salt gal) but a little too lazy to make at home. If this is you too, I recommend giving Skinnygirl a try. Just pour over ice and enjoy. It’s made with Blue Agave clear tequila and is marketed as being just 100 calories per a 4 oz. serving. I liked it a lot better than margaritas I’ve been served at happy hours (too yellow, too sweet), but less than the best margarita I ever had, which was made with fresh lime juice, and enjoyed in multiple quantities in a tiny little bar in Puerto Vallarta, Mexico. I know from watching Bethenny Ever After that not all 50 states carry Skinnygirl Margarita. In New York I can get it from FreshDirect, the online grocery store, for $17.99. And what goes better with a prepared cocktail than cocktail rings? I hit up my mother’s jewelry box for some of hers to model here. 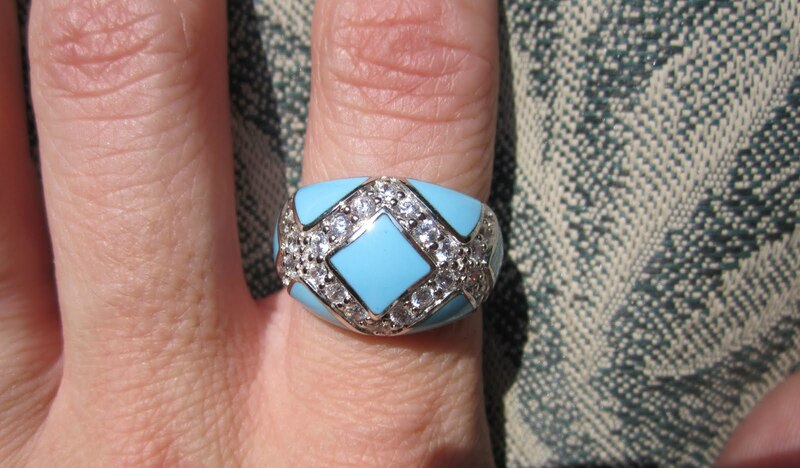 From QVC, turquoise with pavé faux diamonds, set in sterling silver. I like this one a lot, it reminds me of something Rachel Zoe would wear. 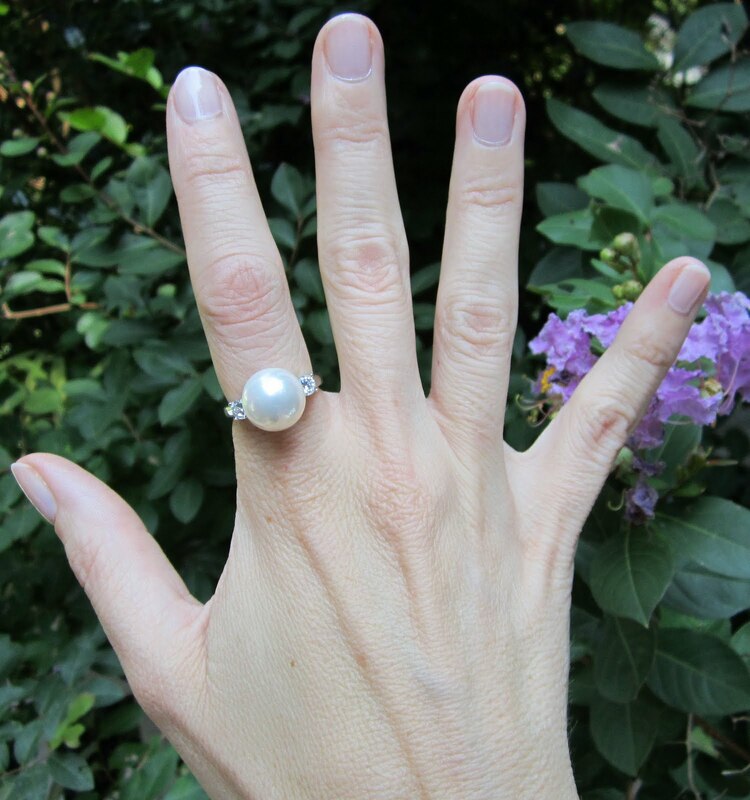 A recent acquisition featuring a cultured pearl and two czs set in sterling silver. The pearl is huge, the size of a small gumball! A turquoise set in sterling silver, from the late 1950s, originally owned by my grandfather. 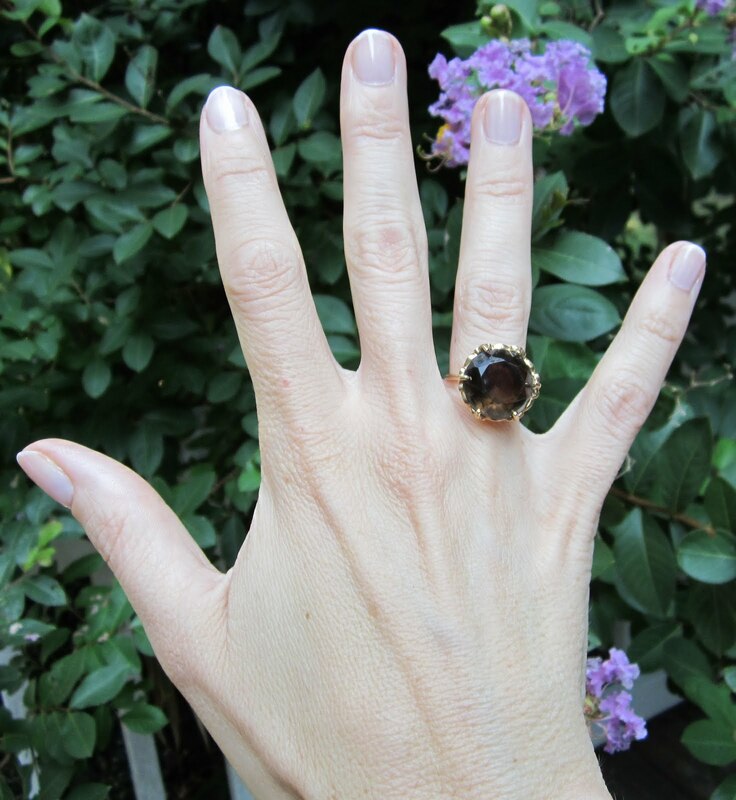 Smoky topaz in gold, circa 1977. A white sapphire cocktail ring, circa 1964. Easily my favorite. I love its Liz Taylor quality. Which one is your favorite? Do you wear cocktail rings? Those rings are simply amazing! I love vintage jewelry, and often wear my grandma's and my great grandma's brooches, earrings and necklaces. Rings sometimes too, but I usually have problems with size - my grandma had thicker finger than I do, so I'm scared of loosing her rings. The white sapphire is my favorite. Cocktail rings are so much fun to wear, and I have a collection that I love adding to. Just another accessory to adore. I love all of those rings (#1 and the last one are my favorites if I have to pick). I have a few cocktail rings but don't wear them very often. I bought one I really love last year in Venice. I lost some weight recently - about 10 pounds and now it's too loose. I wore it out to an event recently and when I made a gesture with my hand, it went flying across the parking lot where we were standing. Luckily, it didn't get damaged. I like them all! It is hard to choose a favorite, but if I had to, then I suppose the turquoise with pavé faux diamonds would be it! I love wearing cocktail rings. I feel they just add a little chic style to any outfit! Ooh, I like the Liz Taylor-like trinket too! So fab. I love Bethenny's show, and am so glad she is having success with her skinny Girl brand. I've never tried it though...I'm a martini girl. I like it salty, not sweet! I'd be hard pressed to pick my favorite, but if I have to I'd say the the smokey topez. And that tip on the skinny drink - priceless. I gal needs to have a drink now and then:) Also, not for nothing, but you could totally be a hand model.....just sayin. Thanks for the tip on Skinnygirl Margarita. It looks yummy!! 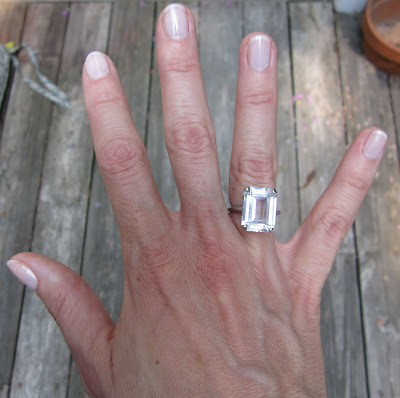 I agree with northeastchic...you would make a great hand model. I especially like the pearl one but the others look mighty pretty! Hi Marina, how are you? I have to stop by your blog and find out what's going on. The show 'PanAm' should be starting soon, right? We have to watch it and compare notes! As for jewelry, I love vintage pieces too. I never thought of myself as a cocktail ring gal, but now I want to get a few. Hello Style Crone, thanks for stopping by! I recognize you from The Citizen Rosebud's blogroll. After seeing the cocktail rings my mother has, I am inspired to start my own collection. It will be hard to choose a first one, however, there are so many out there. Hi Adrienne, I'm glad your ring wasn't damaged when it went flying off your hand! Oh my. I have a few rings like that, too loose, I need to get them sized. I think if I get a cocktail ring I'm going to get one for the index finger and will make sure that baby will stay put! Hi Sarah, do you make any rings? Or do you just focus on earrings, necklaces, and bracelets? I have to admit I have been heavily influenced by Rachel Zoe, who seems to have a stunning collection of, well everything, really, including cocktail rings! 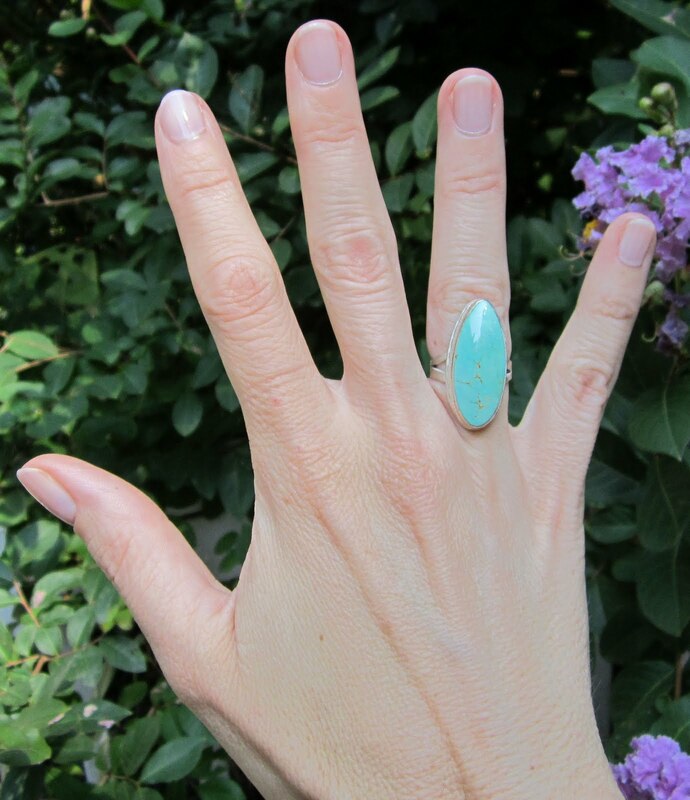 That first turquoise ring pictured really reminds me of something Rachel would wear and I'd be happy to wear it too. So hey Mom, if you're reading this, if you decide you don't want that ring anymore, pass it along to me! Bethenny is hilarious, love her + the show. Will need to try the Skinny girl margaritas. Hi Vahni, I so love that last white sapphire ring. I thought of Liz Taylor immediately. 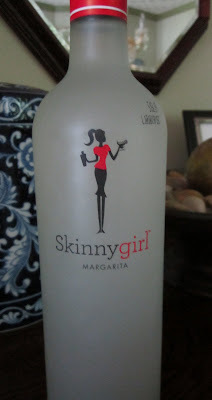 The Skinnygirl margarita was pretty good, I would definitely drink it again. Are you a vodka martini gal or a gin martini? If I'm having gin, make it a gin and tonic. Let's meet for drink when you are here! Hi Northeast Chic, thank you for stopping by! And that is probably the nicest compliment I've had in awhile, that I could be a hand model, thank you so much! I'm coming to your blog to see what you're up to. Nice to meet you! Hi Jeanne, thanks for stopping by, I know you from Aesthetic Alterations! You modeled that gorgeous Hermes scarf. It looked divine on you. I am pretty new to the Hermes scarf addiction, but oh, I'm in. And wouldn't an Hermes scarf go great with that pearl cocktail ring! Hi Fashion Tales, thanks for stopping by! I really like Bethenny more than I thought I would. I never saw 'The Housewives of NYC' but I saw 'Bethenny Getting Married?' and thought she was hilarious and fun. I had to try the Skinnygirl Margarita and now I want to try the Skinnygirl Sangria, which is new. Bethenny is a pretty amazing businesswoman. I found the recent article on her in Forbes magazine interesting, she has been working for quite awhile to make it in the business world and she certainly knocked it out of the park with the Skinnygirl brand. As for rings, I'm with you, I hope my mom passes her amazing jewelry collection onto me! Oh I love rings and those are so pretty, I especially like the second and last one, so pretty! Your have a lovely blog and I'm a new follower! Hope you'll like my blog and follow back! Hi Sara, thanks for stopping by and thanks for joining my blog! I love all these rings too and hope I get to own a few of them someday. In the meantime I am on the hunt for a cocktail ring of my own. I don't know which to chose, it seems there are so many options out there. I'm coming over to your blog to see what you're up to. Nice to meet you! 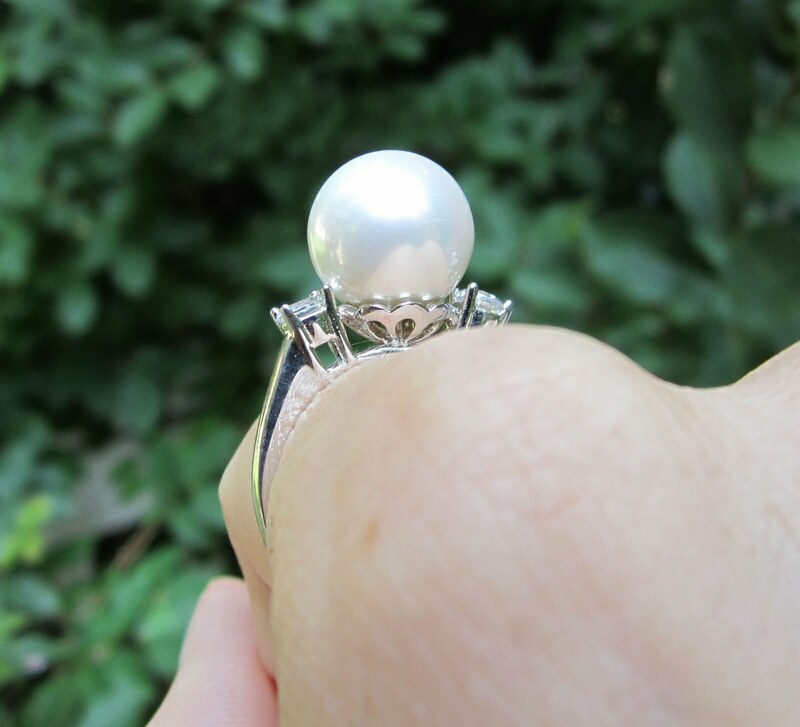 White saphir ring is so beautiful! How many carat please?